Our main topics were the development process in the diocese after Acts 2.1 – spiritual and structure, meditations and thoughts about “how to meet God in our daily reality”, and “formation in action” based on the presentation from the General Assembly from Hamont. 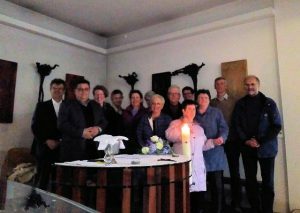 The two days were accompanied by active discussions and exchange of opinions and thoughts, times of quietness and prayers and celebrating the Eucharist. Thank you for sharing your community retreat experience. We are glad that you were able to be together, combining formation and prayer.